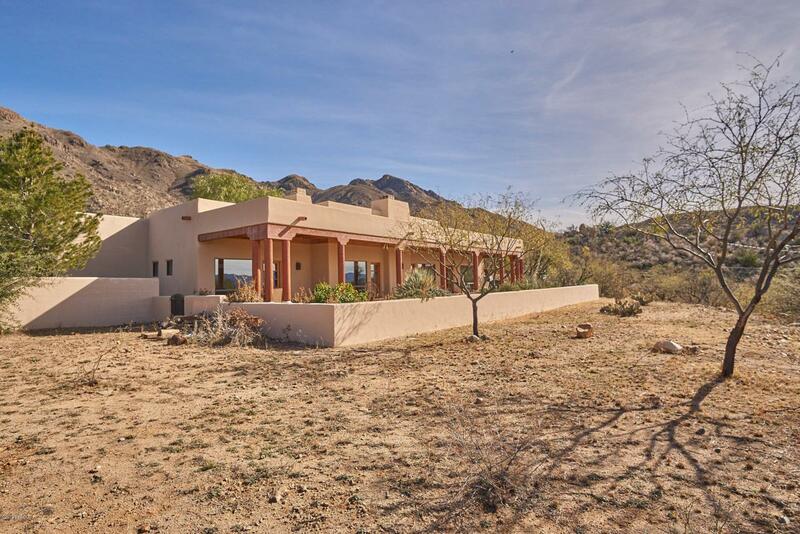 Exceptional custom built home located on premier 4.17 acre lot on the base of the San Cayetano Mountain range! This remarkable home features an elegant foyer entryway, desirable open floor plan, soaring 14 foot pine ceilings with exposed beams, built in shelving, formal living and dining areas, fireplaces in Master bedroom/guest quarters/living room, custom Spanish tile-work, Saltillo tile, stainless steel appliances, gas range strove, dual ovens, upgraded cabinetry, canned lighting, spacious kitchen, laundry room, and large two car garage! Attached guest house includes own private entrance, fireplace, stained concrete flooring, full kitchen, and own bathroom. Exterior of home features side gate entrances, covered front /back patios with wood beamed ceilings, water fountain, established......vegetation, stone paved walkways, and absolute stunning views of the surrounding Santa Cruz County Valley and Mountainside. Guest house can be rented out or can serve as guest quarters! This wonderful home will not last!